Want to Do It Digitally? This tutorial teaches you to cut out paper letters by hand, but if you want to create the same effect on the computer, try the Paper Cut Art Photoshop Actions on Envato Market. You can create complex paper-cutting effects for text or images with just a few clicks. Scribble firmly over the tracing paper. You may find it easier to use a harder-lead pencil for this (like HB). You don't need to scribble over the bigger square. We want the letters on this card to be fine and delicate, as though written with a pencil. The aim is for the lines to flow naturally. This requires thoughtfulness when you’re cutting around the letters. The cut lines are the edges of the pencil lines - inside the smaller square the pencil lines will be the only paper left once the cut is completed. When cutting a corner, cut away from the point in both directions - this will result in a neater cut. Cut the space to the right of the loop on the 'y', remembering you are to cut just on the edge of the pencil mark. The down stroke of the ‘y' needs to line up with the inside of the ‘y’s loop so that the line flows and it doesn't look disjointed. Cut the space to the left of the loop of the 'y’. Where the loop of the ‘y’ crosses itself to join with the ‘o’, ensure your cut is nicely lined up with the inside of the ‘y’ loop. In contrast, the part of the 'e' in 'are' shouldn't line up with the inside of the loop as it's outside of the line. The final tricky cuts in this section are lining up the upstrokes of the 't' and the 'h' of 'rather' with the loop underneath the crossbar of the 't'. 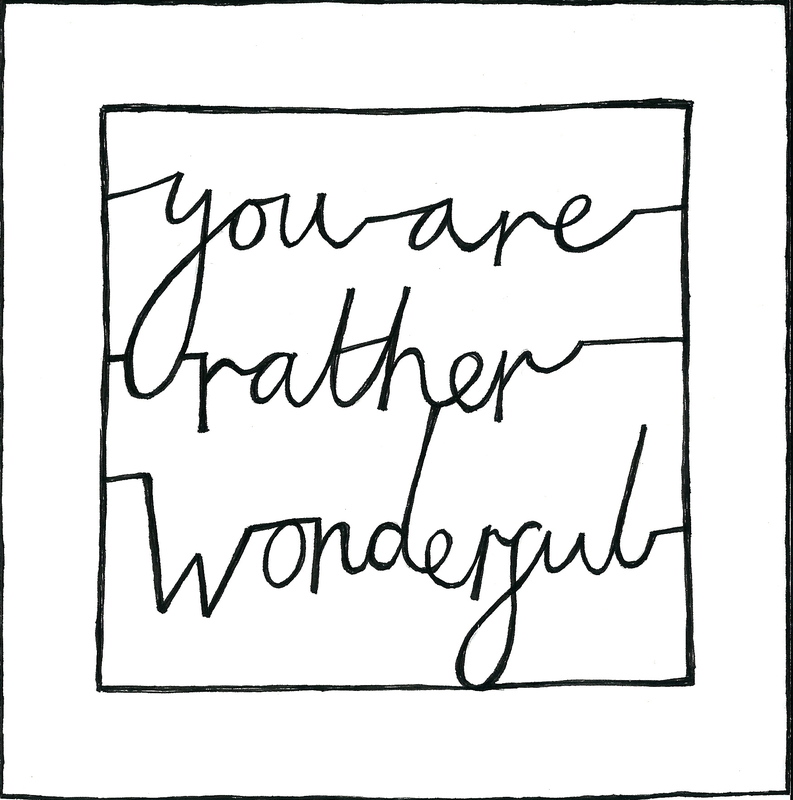 Now move to the space between ‘rather’ and ‘wonderful’, to the right of the ‘d'. The only tricky part of this section should be lining up the loop of the 'y'. To the left of the 'd' there are two more 'e's to negotiate. The first is in 'rather'. The second is in 'wonderful'. Also the 'f' must line up with the outside of its loop. The space underneath ‘wonderful’ to the right of the ‘f’ comes next. You have the underneath of the ‘e’ to line up. You must also ensure the loop of the ‘f’ flows neatly to join with the ‘u', while lining up with the inside of its loop. Remember to use your metal ruler when cutting the straight edges of the square. To the left of the ‘f’ you need only worry about completing the loop of the ‘f’. Now complete the final section. You have an 'e' to line up, which you should be an expert on by now! Also ensure the join between ‘y’ and ‘o’ lines up with the outside of the loop of the ‘y’. Now you've completed the paper cut, you should have something like this in front of you. Now that you've mastered these letters, have a go at writing your own message in cursive script, and transferring and cutting around the letters. You could even frame the card for a lovely piece of art. Do you love paper cutting? What else what you like to learn how to make? I'm an illustrator and designer based in London. I create sets, costumes and puppets for theatre, and illustrations and papercuts for publication and as one-off art works. You can see some of my work and commission me at Robyn Wilson Owen.